A thermocouple is an electrical device consisting of two dissimilar electrical conductors forming electrical junctions at differing temperatures. A thermocouple produces a temperature-dependent voltage as a result of the thermoelectric effect, and this voltage can be interpreted to measure temperature. Thermocouples are a widely used type of temperature sensor. Commercial thermocouples are inexpensive, interchangeable, are supplied with standard connectors, and can measure a wide range of temperatures. In contrast to most other methods of temperature measurement, thermocouples are self powered and require no external form of excitation. The main limitation with thermocouples is precision; system errors of less than one degree Celsius (°C) can be difficult to achieve. Thermocouples are widely used in science and industry. Applications include temperature measurement for kilns, gas turbine exhaust, diesel engines, and other industrial processes. Thermocouples are also used in homes, offices and businesses as the temperature sensors in thermostats, and also as flame sensors in safety devices for gas-powered appliances. In 1821, the German physicist Thomas Johann Seebeck discovered that when different metals are joined at the ends and there is a temperature difference between the joints, a magnetic field is observed. At the time, Seebeck referred to this consequence as thermo-magnetism. The magnetic field he observed was later shown to be due to thermo-electric current. In practical use, the voltage generated at a single junction of two different types of wire is what is of interest as this can be used to measure temperature at very high and low temperatures. The magnitude of the voltage depends on the types of wire being used. Generally, the voltage is in the microvolt range and care must be taken to obtain a usable measurement. Although very little current flows, power can be generated by a single thermocouple junction. Power generation using multiple thermocouples, as in a thermopile, is common. The standard configuration for thermocouple usage is shown in the figure. Briefly, the desired temperature Tsense is obtained using three inputs—the characteristic function E(T) of the thermocouple, the measured voltage V, and the reference junctions' temperature Tref. The solution to the equation E(Tsense) = V + E(Tref) yields Tsense. These details are often hidden from the user since the reference junction block (with Tref thermometer), voltmeter, and equation solver are combined into a single product. is a temperature-dependent material property known as the Seebeck coefficient. , in the lower copper wire. , in the alumel wire. , in the chromel wire. , in the upper copper wire. does not influence the measured voltage. The second and third contributions do not cancel, as they involve different materials. are the Seebeck coefficients of the conductors attached to the positive and negative terminals of the voltmeter, respectively (chromel and alumel in the figure). that have been measured and interpolated over a range of temperatures, for particular thermocouple types (see External links section for access to these tables). Reference junction block inside a Fluke CNX t3000 temperature meter. Two white wires connect to a thermistor (embedded in white thermal compound) to measure the reference junctions' temperature. Reference junction sensor (known as "cold junction compensation"): The reference junction block is allowed to vary in temperature, but the temperature is measured at this block using a separate temperature sensor. This secondary measurement is used to compensate for temperature variation at the junction block. The thermocouple junction is often exposed to extreme environments, while the reference junction is often mounted near the instrument's location. Semiconductor thermometer devices are often used in modern thermocouple instruments. curve, independent of any other details. In reality, thermocouples are affected by issues such as alloy manufacturing uncertainties, aging effects, and circuit design mistakes/misunderstandings. , the same error will be carried over to the temperature measurement. For the simplest measurements, thermocouple wires are connected to copper far away from the hot or cold point whose temperature is measured; the cold junction is then assumed to be at room temperature, but that temperature can vary. Junctions should be made in a reliable manner, but there are many possible approaches to accomplish this. For low temperatures, junctions can be brazed or soldered; however, it may be difficult to find a suitable flux and this may not be suitable at the sensing junction due to the solder's low melting point. Reference and extension junctions are therefore usually made with screw terminal blocks. For high temperatures, a common approach is a spot weld or crimp using a durable material. A common myth regarding thermocouples is that junctions must be made cleanly without involving a third metal, to avoid unwanted added EMFs. This may result from another common misunderstanding that the voltage is generated at the junction. In fact, the junctions should in principle have uniform internal temperature; therefore, no voltage is generated at the junction. The voltage is generated in the thermal gradient, along the wire. A thermocouple produces small signals, often microvolts in magnitude. Precise measurements of this signal require an amplifier with low input offset voltage and with care taken to avoid thermal EMFs from self-heating within the voltmeter itself. If the thermocouple wire has a high resistance for some reason (poor contact at junctions, or very thin wires used for fast thermal response), the measuring instrument should have high input impedance to prevent an offset in the measured voltage. A useful feature in thermocouple instrumentation will simultaneously measure resistance and detect faulty connections in the wiring or at thermocouple junctions. Impurities affect each batch of metal differently, producing variable Seebeck coefficients. To match the standard behaviour, thermocouple wire manufacturers will deliberately mix in additional impurities to "dope" the alloy, compensating for uncontrolled variations in source material. As a result, there are standard and specialized grades of thermocouple wire, depending on the level of precision demanded in the thermocouple behaviour. Precision grades may only be available in matched pairs, where one wire is modified to compensate for deficiencies in the other wire. curve but for various reasons they are not designed to be used in extreme environments and so they cannot be used at the sensing junction in some applications. For example, an extension wire may be in a different form, such as highly flexible with stranded construction and plastic insulation, or be part of a multi-wire cable for carrying many thermocouple circuits. With expensive noble metal thermocouples, the extension wires may even be made of a completely different, cheaper material that mimics the standard type over a reduced temperature range. Thermocouples are often used at high temperatures and in reactive furnace atmospheres. In this case, the practical lifetime is limited by thermocouple aging. The thermoelectric coefficients of the wires in a thermocouple that is used to measure very high temperatures may change with time, and the measurement voltage accordingly drops. 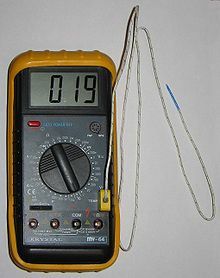 The simple relationship between the temperature difference of the junctions and the measurement voltage is only correct if each wire is homogeneous (uniform in composition). As thermocouples age in a process, their conductors can lose homogeneity due to chemical and metallurgical changes caused by extreme or prolonged exposure to high temperatures. If the aged section of the thermocouple circuit is exposed to a temperature gradient, the measured voltage will differ, resulting in error. Aged thermocouples are only partly modified; for example, being unaffected in the parts outside the furnace. For this reason, aged thermocouples cannot be taken out of their installed location and recalibrated in a bath or test furnace to determine error. This also explains why error can sometimes be observed when an aged thermocouple is pulled partly out of a furnace—as the sensor is pulled back, aged sections may see exposure to increased temperature gradients from hot to cold as the aged section now passes through the cooler refractory area, contributing significant error to the measurement. Likewise, an aged thermocouple that is pushed deeper into the furnace might sometimes provide a more accurate reading if being pushed further into the furnace causes the temperature gradient to occur only in a fresh section.
) first, followed by the negative electrode. Characteristic functions for thermocouples that reach intermediate temperatures, as covered by nickel-alloy thermocouple types E, J, K, M, N, T. Also shown are the noble-metal alloy type P and the pure noble-metal combinations gold–platinum and platinum–palladium. Type E (chromel–constantan) has a high output (68 µV/°C), which makes it well suited to cryogenic use. Additionally, it is non-magnetic. Wide range is −50 °C to +740 °C and narrow range is −110 °C to +140 °C. Type J (iron–constantan) has a more restricted range (−40 °C to +750 °C) than type K but higher sensitivity of about 50 µV/°C. The Curie point of the iron (770 °C) causes a smooth change in the characteristic, which determines the upper temperature limit. Type K (chromel–alumel) is the most common general-purpose thermocouple with a sensitivity of approximately 41 µV/°C. It is inexpensive, and a wide variety of probes are available in its −200 °C to +1350 °C (−330 °F to +2460 °F) range. 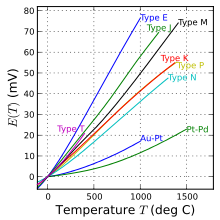 Type K was specified at a time when metallurgy was less advanced than it is today, and consequently characteristics may vary considerably between samples. One of the constituent metals, nickel, is magnetic; a characteristic of thermocouples made with magnetic material is that they undergo a deviation in output when the material reaches its Curie point, which occurs for type K thermocouples at around 185 °C. They operate very well in oxidizing atmospheres. If, however, a mostly reducing atmosphere (such as hydrogen with a small amount of oxygen) comes into contact with the wires, the chromium in the chromel alloy oxidizes. This reduces the emf output, and the thermocouple reads low. This phenomenon is known as green rot, due to the color of the affected alloy. Although not always distinctively green, the chromel wire will develop a mottled silvery skin and become magnetic. An easy way to check for this problem is to see whether the two wires are magnetic (normally, chromel is non-magnetic). Hydrogen in the atmosphere is the usual cause of green rot. At high temperatures, it can diffuse through solid metals or an intact metal thermowell. Even a sheath of magnesium oxide insulating the thermocouple will not keep the hydrogen out. Type M (82%Ni/18%Mo–99.2%Ni/0.8%Co, by weight) are used in vacuum furnaces for the same reasons as with type C (described below). Upper temperature is limited to 1400 °C. It is less commonly used than other types. Type N (Nicrosil–Nisil) thermocouples are suitable for use between −270 °C and +1300 °C, owing to its stability and oxidation resistance. Sensitivity is about 39 µV/°C at 900 °C, slightly lower compared to type K.
A gradual and generally cumulative drift in thermal EMF on long exposure at elevated temperatures. This is observed in all base-metal thermoelement materials and is mainly due to compositional changes caused by oxidation, carburization, or neutron irradiation that can produce transmutation in nuclear reactor environments. In the case of type-K thermocouples, manganese and aluminium atoms from the KN (negative) wire migrate to the KP (positive) wire, resulting in a down-scale drift due to chemical contamination. This effect is cumulative and irreversible. A short-term cyclic change in thermal EMF on heating in the temperature range about 250–650 °C, which occurs in thermocouples of types K, J, T, and E. This kind of EMF instability is associated with structural changes such as magnetic short-range order in the metallurgical composition. A time-independent perturbation in thermal EMF in specific temperature ranges. This is due to composition-dependent magnetic transformations that perturb the thermal EMFs in type-K thermocouples in the range about 25–225 °C, and in type J above 730 °C. The Nicrosil and Nisil thermocouple alloys show greatly enhanced thermoelectric stability relative to the other standard base-metal thermocouple alloys because their compositions substantially reduce the thermoelectric instabilities described above. This is achieved primarily by increasing component solute concentrations (chromium and silicon) in a base of nickel above those required to cause a transition from internal to external modes of oxidation, and by selecting solutes (silicon and magnesium) that preferentially oxidize to form a diffusion-barrier, and hence oxidation-inhibiting films. Type T (copper–constantan) thermocouples are suited for measurements in the −200 to 350 °C range. Often used as a differential measurement, since only copper wire touches the probes. Since both conductors are non-magnetic, there is no Curie point and thus no abrupt change in characteristics. Type-T thermocouples have a sensitivity of about 43 µV/°C. Note that copper has a much higher thermal conductivity than the alloys generally used in thermocouple constructions, and so it is necessary to exercise extra care with thermally anchoring type-T thermocouples. Characteristic functions for high-temperature thermocouple types, showing Pt/Rh, W/Re, Pt/Mo, and Ir/Rh-alloy thermocouples. Also shown is the Pt–Pd pure-metal thermocouple. Types B, R, and S thermocouples use platinum or a platinum/rhodium alloy for each conductor. These are among the most stable thermocouples, but have lower sensitivity than other types, approximately 10 µV/°C. Type B, R, and S thermocouples are usually used only for high-temperature measurements due to their high cost and low sensitivity. Type B (70%Pt/30%Rh–94%Pt/6%Rh, by weight) thermocouples are suited for use at up to 1800 °C. Type-B thermocouples produce the same output at 0 °C and 42 °C, limiting their use below about 50 °C. The emf function has a minimum around 21 °C, meaning that cold-junction compensation is easily performed, since the compensation voltage is essentially a constant for a reference at typical room temperatures. Type R (87%Pt/13%Rh–Pt, by weight) thermocouples are used 0 to 1600 °C. Type S (90%Pt/10%Rh–Pt, by weight) thermocouples, similar to type R, are used up to 1600 °C. Before the introduction of the International Temperature Scale of 1990 (ITS-90), precision type-S thermocouples were used as the practical standard thermometers for the range of 630 °C to 1064 °C, based on an interpolation between the freezing points of antimony, silver, and gold. Starting with ITS-90, platinum resistance thermometers have taken over this range as standard thermometers. These thermocouples are well suited for measuring extremely high temperatures. Typical uses are hydrogen and inert atmospheres, as well as vacuum furnaces. They are not used in oxidizing environments at high temperatures because of embrittlement. A typical range is 0 to 2315 °C, which can be extended to 2760 °C in inert atmosphere and to 3000 °C for brief measurements. (95%W/5%Re–74%W/26%Re, by weight) maximum temperature will be measured by type-c thermocouple is 2329 ℃. Thermocouple characteristics at low temperatures. The AuFe-based thermocouple shows a steady sensitivity down to low temperatures, whereas conventional types soon flatten out and lose sensitivity at low temperature. In these thermocouples (chromel–gold/iron alloy), the negative wire is gold with a small fraction (0.03–0.15 atom percent) of iron. The impure gold wire gives the thermocouple a high sensitivity at low temperatures (compared to other thermocouples at that temperature), whereas the chromel wire maintains the sensitivity near room temperature. It can be used for cryogenic applications (1.2–300 K and even up to 600 K). Both the sensitivity and the temperature range depend on the iron concentration. The sensitivity is typically around 15 µV/K at low temperatures, and the lowest usable temperature varies between 1.2 and 4.2 K.
Type P (55%Pd/31%Pt/14%Au–65%Au/35%Pd, by weight) thermocouples give a thermoelectric voltage that mimics the type K over the range 500 °C to 1400 °C, however they are constructed purely of noble metals and so shows enhanced corrosion resistance. This combination is also known as Platinel II. Thermocouples of platinum/molybdenum-alloy (95%Pt/5%Mo–99.9%Pt/0.1%Mo, by weight) are sometimes used in nuclear reactors, since they show a low drift from nuclear transmutation induced by neutron irradiation, compared to the platinum/rhodium-alloy types. The use of two wires of iridium/rhodium alloys can provide a thermocouple that can be used up to about 2000 °C in inert atmospheres. Thermocouples made from two different, high-purity noble metals can show high accuracy even when uncalibrated, as well as low levels of drift. Two combinations in use are gold–platinum and platinum–palladium. Their main limitations are the low melting points of the metals involved (1064 °C for gold and 1555 °C for palladium). These thermocouples tend to be more accurate than type S, and due to their economy and simplicity are even regarded as competitive alternatives to the platinum resistance thermometers that are normally used as standard thermometers. NASA is developing a Multi-Mission Radioisotope Thermoelectric Generator in which the thermocouples would be made of skutterudite, which can function with a smaller temperature difference than the current tellurium designs. This would mean that an otherwise similar RTG would generate 25% more power at the beginning of a mission and at least 50% more after seventeen years. NASA hopes to use the design on the next New Frontiers mission. Chromel/AuFe −272 +300 N/A N/A Reproducibility 0.2% of the voltage. Each sensor needs individual calibration. Typical low cost type K thermocouple (with standard type K connector). While the wires can survive and function at high temperatures, the plastic insulation will start to break down at 300 °C. The wires that make up the thermocouple must be insulated from each other everywhere, except at the sensing junction. Any additional electrical contact between the wires, or contact of a wire to other conductive objects, can modify the voltage and give a false reading of temperature. Plastics are suitable insulators for low temperatures parts of a thermocouple, whereas ceramic insulation can be used up to around 1000 °C. Other concerns (abrasion and chemical resistance) also affect the suitability of materials. When wire insulation disintegrates, it can result in an unintended electrical contact at a different location from the desired sensing point. If such a damaged thermocouple is used in the closed loop control of a thermostat or other temperature controller, this can lead to a runaway overheating event and possibly severe damage, as the false temperature reading will typically be lower than the sensing junction temperature. Failed insulation will also typically outgas, which can lead to process contamination. For parts of thermocouples used at very high temperatures or in contamination-sensitive applications, the only suitable insulation may be vacuum or inert gas; the mechanical rigidity of the thermocouple wires is used to keep them separated. Temperature ratings for insulations may vary based on what the overall thermocouple construction cable consists of. Note: T300 is a new high-temperature material that was recently approved by UL for 300 °C operating temperatures. Thermocouples are suitable for measuring over a large temperature range, from −270 up to 3000 °C (for a short time, in inert atmosphere). Applications include temperature measurement for kilns, gas turbine exhaust, diesel engines, other industrial processes and fog machines. They are less suitable for applications where smaller temperature differences need to be measured with high accuracy, for example the range 0–100 °C with 0.1 °C accuracy. For such applications thermistors, silicon bandgap temperature sensors and resistance thermometers are more suitable. Type B, S, R and K thermocouples are used extensively in the steel and iron industries to monitor temperatures and chemistry throughout the steel making process. Disposable, immersible, type S thermocouples are regularly used in the electric arc furnace process to accurately measure the temperature of steel before tapping. The cooling curve of a small steel sample can be analyzed and used to estimate the carbon content of molten steel. Thermocouple connection in gas appliances. The end ball (contact) on the left is insulated from the fitting by an insulating washer. The thermocouple line consists of copper wire, insulator and outer metal (usually copper) sheath which is also used as ground. Many gas-fed heating appliances such as ovens and water heaters make use of a pilot flame to ignite the main gas burner when required. If the pilot flame goes out, unburned gas may be released, which is an explosion risk and a health hazard. To prevent this, some appliances use a thermocouple in a fail-safe circuit to sense when the pilot light is burning. The tip of the thermocouple is placed in the pilot flame, generating a voltage which operates the supply valve which feeds gas to the pilot. So long as the pilot flame remains lit, the thermocouple remains hot, and the pilot gas valve is held open. If the pilot light goes out, the thermocouple temperature falls, causing the voltage across the thermocouple to drop and the valve to close. Where the probe may be easily placed above the flame, a rectifying sensor may often be used instead. With part ceramic construction, they may also be known as flame rods, flame sensors or flame detection electrodes. Some combined main burner and pilot gas valves (mainly by Honeywell) reduce the power demand to within the range of a single universal thermocouple heated by a pilot (25 mV open circuit falling by half with the coil connected to a 10–12 mV, 0.2–0.25 A source, typically) by sizing the coil to be able to hold the valve open against a light spring, but only after the initial turning-on force is provided by the user pressing and holding a knob to compress the spring during lighting of the pilot. These systems are identifiable by the "press and hold for x minutes" in the pilot lighting instructions. (The holding current requirement of such a valve is much less than a bigger solenoid designed for pulling the valve in from a closed position would require.) Special test sets are made to confirm the valve let-go and holding currents, because an ordinary milliammeter cannot be used as it introduces more resistance than the gas valve coil. Apart from testing the open circuit voltage of the thermocouple, and the near short-circuit DC continuity through the thermocouple gas valve coil, the easiest non-specialist test is substitution of a known good gas valve. Some systems, known as millivolt control systems, extend the thermocouple concept to both open and close the main gas valve as well. Not only does the voltage created by the pilot thermocouple activate the pilot gas valve, it is also routed through a thermostat to power the main gas valve as well. Here, a larger voltage is needed than in a pilot flame safety system described above, and a thermopile is used rather than a single thermocouple. Such a system requires no external source of electricity for its operation and thus can operate during a power failure, provided that all the other related system components allow for this. This excludes common forced air furnaces because external electrical power is required to operate the blower motor, but this feature is especially useful for un-powered convection heaters. A similar gas shut-off safety mechanism using a thermocouple is sometimes employed to ensure that the main burner ignites within a certain time period, shutting off the main burner gas supply valve should that not happen. Out of concern about energy wasted by the standing pilot flame, designers of many newer appliances have switched to an electronically controlled pilot-less ignition, also called intermittent ignition. With no standing pilot flame, there is no risk of gas buildup should the flame go out, so these appliances do not need thermocouple-based pilot safety switches. As these designs lose the benefit of operation without a continuous source of electricity, standing pilots are still used in some appliances. The exception is later model instantaneous (aka "tankless") water heaters that use the flow of water to generate the current required to ignite the gas burner; these designs also use a thermocouple as a safety cut-off device in the event the gas fails to ignite, or if the flame is extinguished. Thermopiles are used for measuring the intensity of incident radiation, typically visible or infrared light, which heats the hot junctions, while the cold junctions are on a heat sink. It is possible to measure radiative intensities of only a few μW/cm2 with commercially available thermopile sensors. For example, some laser power meters are based on such sensors; these are specifically known as thermopile laser sensor. The principle of operation of a thermopile sensor is distinct from that of a bolometer, as the latter relies on a change in resistance. A thermocouple can produce current to drive some processes directly, without the need for extra circuitry and power sources. For example, the power from a thermocouple can activate a valve when a temperature difference arises. The electrical energy generated by a thermocouple is converted from the heat which must be supplied to the hot side to maintain the electric potential. A continuous transfer of heat is necessary because the current flowing through the thermocouple tends to cause the hot side to cool down and the cold side to heat up (the Peltier effect). Thermocouples can be connected in series to form a thermopile, where all the hot junctions are exposed to a higher temperature and all the cold junctions to a lower temperature. The output is the sum of the voltages across the individual junctions, giving larger voltage and power output. In a radioisotope thermoelectric generator, the radioactive decay of transuranic elements as a heat source has been used to power spacecraft on missions too far from the Sun to use solar power. Thermopiles heated by kerosene lamps were used to run batteryless radio receivers in isolated areas. There are commercially produced lanterns that use the heat from a candle to run several light-emitting diodes, and thermoelectrically-powered fans to improve air circulation and heat distribution in wood stoves. Chemical production and petroleum refineries will usually employ computers for logging and for limit testing the many temperatures associated with a process, typically numbering in the hundreds. For such cases, a number of thermocouple leads will be brought to a common reference block (a large block of copper) containing the second thermocouple of each circuit. The temperature of the block is in turn measured by a thermistor. Simple computations are used to determine the temperature at each measured location. A thermocouple can be used as a vacuum gauge over the range of approximately 0.001 to 1 torr absolute pressure. In this pressure range, the mean free path of the gas is comparable to the dimensions of the vacuum chamber, and the flow regime is neither purely viscous nor purely molecular. In this configuration, the thermocouple junction is attached to the centre of a short heating wire, which is usually energised by a constant current of about 5 mA, and the heat is removed at a rate related to the thermal conductivity of the gas. where P is the gas pressure, B is a constant that depends on the thermocouple temperature, the gas composition and the vacuum-chamber geometry, V0 is the thermocouple voltage at zero pressure (absolute), and V is the voltage indicated by the thermocouple. The alternative is the Pirani gauge, which operates in a similar way, over approximately the same pressure range, but is only a 2-terminal device, sensing the change in resistance with temperature of a thin electrically heated wire, rather than using a thermocouple. ^ "Thermocouple temperature sensors". Temperatures.com. Retrieved 2007-11-04. ^ a b Ramsden, Ed (September 1, 2000). "Temperature measurement". Sensors. Retrieved 2010-02-19. ^ "Technical Notes: Thermocouple Accuracy". IEC 584-2(1982)+A1(1989). Retrieved 2010-04-28. ^ "How to Prevent Temperature Measurement Errors When Installing Thermocouple Sensors and Transmitters" (PDF). acromag.com. Acromag. Retrieved 3 February 2017. ^ Pyromation, Inc. "Thermocouple theory" (2009). ^ Rowe, Martin (2013). "Thermocouples: Simple but misunderstood", EDN Network. ^ Kerlin, T.W. & Johnson, M.P. (2012). Practical Thermocouple Thermometry (2nd Ed.). Research Triangle Park: ISA. pp. 110–112. ISBN 978-1-937560-27-0. ^ Buschow, K. H. J. Encyclopedia of materials: science and technology, Elsevier, 2001 ISBN 0-08-043152-6, p. 5021, table 1. ^ Manual on the Use of Thermocouples in Temperature Measurement (4th Ed.). ASTM. 1993. pp. 48–51. ISBN 978-0-8031-1466-1. ^ "Helping thermocouples do the job... - Transcat". www.transcat.com. ^ Burley, Noel A. Nicrosil/Nisil Type N Thermocouples. www.omega.com. ^ Type N Thermocouple Versus Type K Thermocouple in A Brick Manufacturing Facility. jms-se.com. ^ "Thermocouple Theory". Capgo. Retrieved 17 December 2013. ^ "Supplementary Information for the ITS-90". International Bureau of Weights and Measures. Archived from the original on 2012-09-10. Retrieved 2 February 2018. ^ a b c d OMEGA Engineering Inc. "Tungsten-Rhenium Thermocouples Calibration Equivalents". ^ a b Pollock, Daniel D. (1991). Thermocouples: Theory and Properties. CRC Press. pp. 249–. ISBN 978-0-8493-4243-1. ^ Other Types of Thermocouples. dugantech.com. ^ a b Thermoelectricity: Theory, Thermometry, Tool, Issue 852 by Daniel D. Pollock. ^ 5629 Gold Platinum Thermocouple Archived 2014-01-05 at the Wayback Machine. fluke.com. ^ BIPM – "Techniques for Approximating the ITS-90" Archived 2014-02-01 at the Wayback Machine Chapter 9: Platinum Thermocouples. ^ "Spacecraft 'Nuclear Batteries' Could Get a Boost from New Materials". JPL News. Jet Propulsion Laboratory. 13 October 2016. ^ Flammable Vapor Ignition Resistant Water Heaters: Service Manual (238-44943-00D) (PDF). Bradford White. pp. 11–16. Retrieved 11 June 2014. ^ New Scientist. Reed Business Information. 10 January 1974. pp. 67–. ISSN 0262-4079. Retrieved 28 May 2012. ^ Hablanian, M. H. (1997) High-Vacuum Technology: A Practical Guide, Second Ed., Marcel Dekker Inc., pp. 19–22, 45–47 & 438–443, ISBN 0-8247-9834-1. ^ Voege, W. (1906) Physik Zeit., 7: 498. ^ Van Atta, C. M. (1965) Vacuum Science and Engineering, McGraw-Hill Book Co. pp. 78–90. Wikimedia Commons has media related to Thermocouples. Python package thermocouples_reference containing characteristic curves of many thermocouple types. R package  Temperature Measurement with Thermocouples, RTD and IC Sensors.